EDUCATING IN FREEDOM, AUTONOMY AND RESPONSIBILITY. A child is not a miniature adult. He is a unique individual who will develop at his own pace in situations and ways that are his own. His development is intimately linked to trust: he must feel loved, accepted, encouraged and, especially, like a participant in an environment that intrigues him, motivates him but also scares him. The method created by Maria Montessori is based on respect for children, their needs and their own learning pace, especially during his first years, which is a time when he assimilates the basics for all future development. “Help me do it myself”. 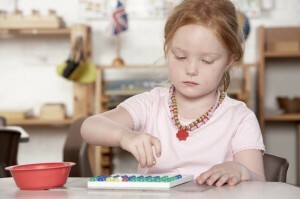 It is one of the most popular phrases of its founder used to illustrate the Montessori method. The child chooses the work that suits him best. He can spend as much time as needed on it, do it again or come back to it. He corrects himself because that is how he learns. Bit by bit, he finds his own balance and becomes responsible and autonomous. Above all, he grows up with a healthy self-esteem.